Every part of your concealed carry system is vitally important. We spend a lot of time thinking about the best guns for concealed carry. I think you’ll agree that the holster is equally important. It must be comfortable, accessible, and safe. Why You Need a Good Holster? What to Consider to Choose a Great Concealed Carry Holster? Different types of holsters are more suited for concealment than others (we’ll get into this in a minute). A self-defense firearm does no good if it’s left at home instead of taken with you when you leave the house. Carrying a firearm is not always comfortable, so the ideal carry holster should eliminate common problems. It needs to distribute the weight evenly and hold the firearm so it doesn’t poke into your body. Comfort is easy to underestimate when making your purchase, a mistake you’ll only realize once you’ve committed to carrying for a full day. A proper holster always covers the trigger of the firearm completely and is rigid enough to keep the trigger from being pulled. Guns don’t just go off on their own, but they do go off when the trigger is pulled (intentionally or not). There are many stories of people who have shot themselves because they chose a poor or severely worn holster. What happens if you have to run across the street? If you slip and fall on something wet? If you bend over quickly to pick up something at the supermarket? If your holster doesn’t hold your firearm securely and allows it to come loose, you’re in trouble. A dropped firearm is incredibly dangerous. Your holster needs to match your level of activity to securely hold your firearm regardless of what you’re doing. Although some states allow open carry, most people who carry a firearm prefer to keep it concealed. In some states, it’s mandatory and exposing your gun can end up in legal trouble. Most people prefer to hide the fact that they are carrying a firearm, and this means a holster that fits appropriately. 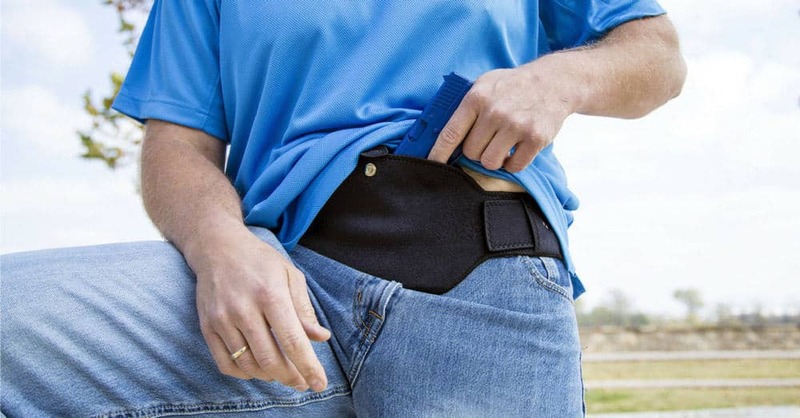 A holster meant for concealment will ride closer to the body, deeper in the pants, and naturally fit the contour of your body to avoid sticking out and being seen. Those are the primary responsibilities for a holster. There are different holsters that have strengths and weaknesses, so it’s important to understand the different types of holsters and when to choose them. This is the first debate you’re likely to come up against when researching holsters. An IWB holster is one that sits Inside the Waistband, while an OWB holster sits Outside the Waistband. An IWB holster rides inside the waistband of your pants and attaches to your belt line. It is therefore much closer to your body, meaning that concealment is much easier. An IWB holster will follow your body more closely, so the firearm will stick out less when you bend or turn with your body. A reasonably sized gun in an IWB holster can easily be concealed under a loose-fitting T-shirt. 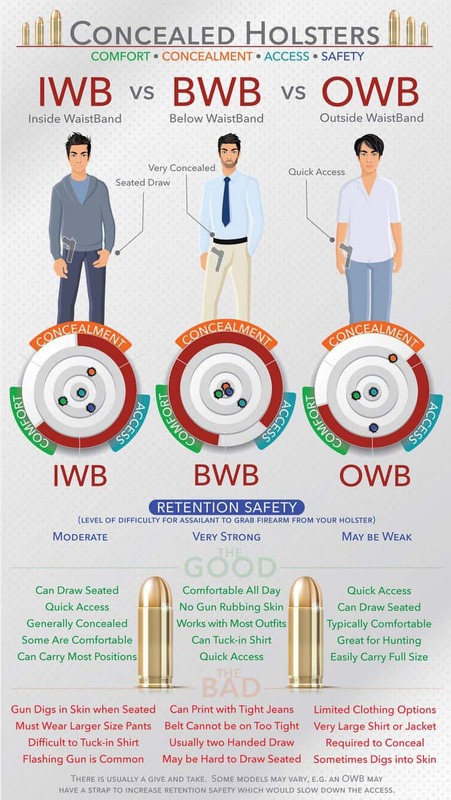 IWB holsters are among the most popular options for people who carry concealed regularly because of their mix of comfort, security, and accessibility. An OWB holster also attaches to your belt line but rides outside the waistband of the pants. 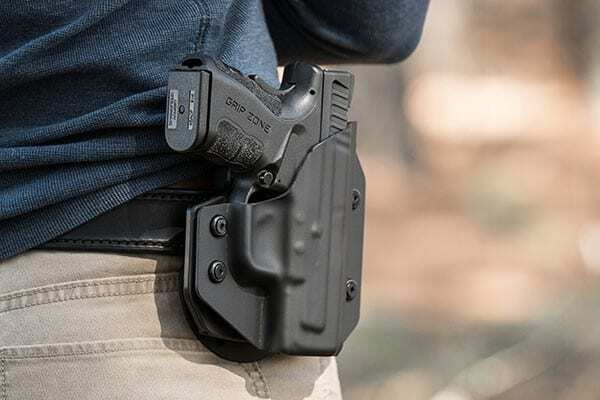 OWB holsters are frequently used for hunting, hiking, competition shooting, or other activities where concealment is not required and faster access is beneficial. OWB holsters are usually more comfortable because they do not wedge the gun between your body and your pants. It is also easier to carry a large gun in an OWB holster for the same reason. The biggest downside to OWB holsters is that they are harder to conceal. If you are choosing an OWB for concealment, it’s crucial to buy one that is properly designed to hold the gun very high and close to the body. A holster which juts out straight to the side will be nearly impossible to conceal comfortably. A belly band holster is exactly what it sounds like. Made of a flexible material, the belly band wraps around your belly or waist. The belly band is a popular option for carrying concealed under workout clothes or other outfits without a belt. The belly band wraps evenly around your mid-section and allows you to easily conceal a small to medium-sized pistol comfortably. The belly band does have its drawbacks though. Concealment can be slightly slower than from a traditional carry position, and retention is not as secure as a Kydex or leather holster on the belt. Carrying in a pocket unprotected is common, but dangerous. Pocket holsters are designed to slip into the pocket and protect the firearm from accidental damage. As an added bonus, most pocket holsters have a square shape that makes any impression look like a cell phone in your pocket and not a firearm. Pocket holsters are easy, convenient, comfortable, and a reasonably secure way of pocket carrying a firearm. It is difficult to carry anything above a small .380 or snub nose .38 in a pocket, and the draw from a pocket can be slow or restricted in different situations. 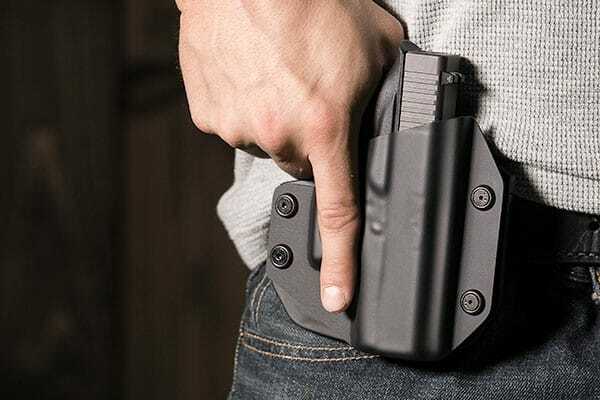 Many gun owners have a pocket holster for their backup guns, but it’s typically not the best option for a primary method of carry. Ankle holsters strap around the ankle to conceal a firearm underneath a boot or pant leg. They have fallen out of favor in recent years because of all the innovations in compact guns and carry methods, but some gun owners still like them. Ankle holsters are an easy way to conceal a small firearm in a method that is very likely to be unseen. They are most popular for carrying backups to larger primary guns, or for carrying at events and areas where it is vital for the firearm to remain concealed. 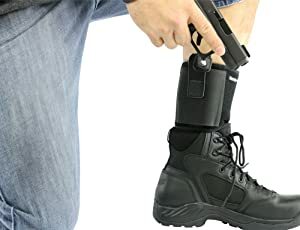 The most obvious downside is that the draw is very difficult from an ankle holster, and you may have no access to it in an immediate encounter. They also tend to be uncomfortable for long periods of time, especially in hot weather. 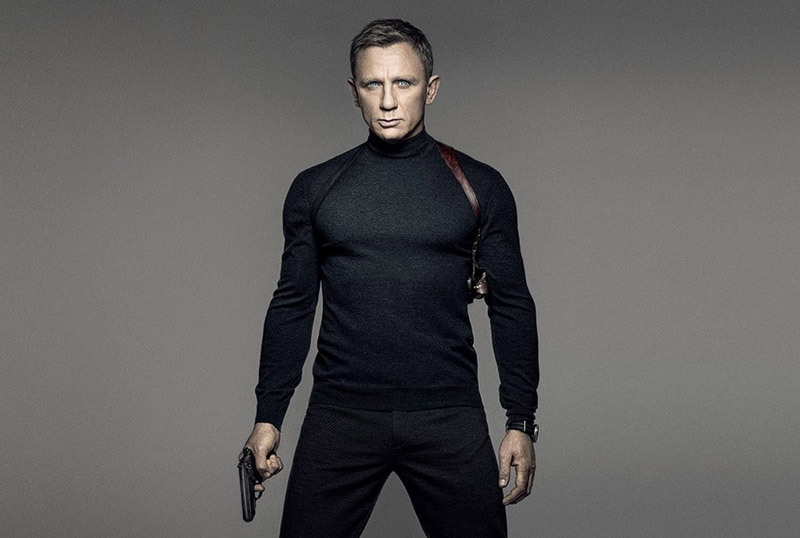 A shoulder holster is worn around the shoulders and chest, typically concealed beneath a coat or a jacket. The firearm can be held either vertically or horizontally, and frequently the side opposite the firearm has storage for extra magazines. Shoulder holsters can be somewhat cumbersome, especially in warm weather, but they are one option for people who want to conceal a larger firearm or want to keep the weight off of their belt-line where it can cause back pain. Crossbreed is a heavyweight name in the concealed carry industry, and for good reason. They make some of the most comfortable, concealable, and reliable holsters on the market. The Crossbreed Supertuck was designed around a holster that is comfortable to wear all the time, concealable, and adaptable to the user’s needs. It is a hybrid holster, combining a kydex molded shell with a black cowleather backing. This can provide the best of both worlds as the Kydex will securely hold your firearm, while the leather backer is what will be contacting your body and is much more comfortable than rubbing against plastic the whole time you’re carrying. Like all other hybrid holsters, there is a trade-off for the comfort. Leather and other backing material can fold and become loose over time. When this happens, it can potentially create a safety hazard where the tip of the backing can get folded into the holster and pull the trigger of your pistol. You should commit to a regular inspection schedule to carry a holster such as this. Like the Alien Gear, the Super Tuck is adjustable for cant and ride height, allowing you to completely customize the experience to match your needs. Although hybrid holsters are very comfortable, Kydex does have its advantage. It is rigid and will not deform at all, maintaining safe and proper use for a long time to come. It also provides secure retention on all sides. 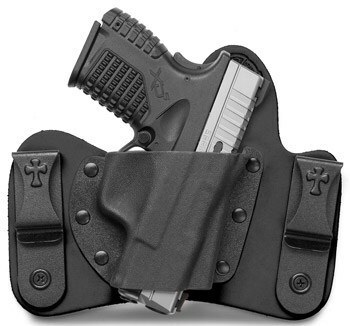 The concealment express holster is all Kydex, allowing for a snug and secure fit. They are designed with an audible “Posi-Click” retention system – you will be able to hear a click when your firearm is fully inserted, telling you the retention system is fully engaged. The retention system is also adjustable to suit your preferences for pressure. Of course, although Kydex holsters are popular for their security, they may not be very comfortable. Kydex is known to stick and poke the wearer. 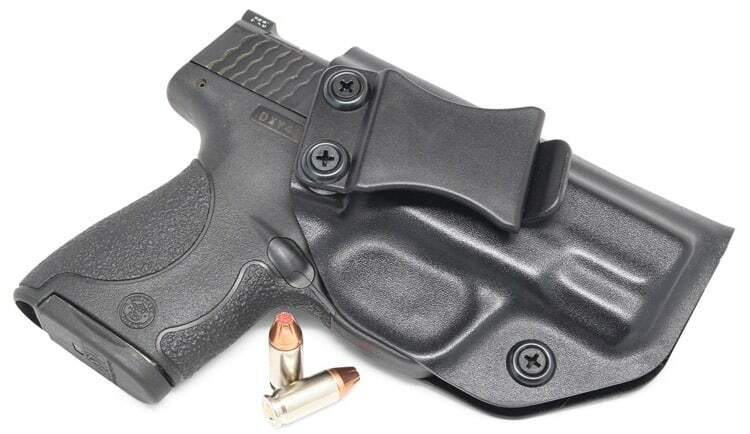 The Concealment Express Kydex IWB holster is very lightweight at less than 3 oz. It features a sweat-blocking system to protect your firearm from acidic sweat that can cause rust and other corrosion. In addition, it is easily adjustable for cant from 0-15 degrees, allowing you to set it up for almost any concealed position. The holsters are built tough and come with a lifetime warranty. The Alien Gear Cloak Mod is a feature-packed option at a great price. The Cloak Mod is an OWB holster that attaches to your belt with either a belt slide for more secure mounting or a paddle to clip securely to pants without a belt and for easy removal. Inside the holster is a spring steel “flexplate”. When a pistol is inserted into the holster, the flexplate pushes against the firearm to hold it in place. This increases the retention force of the holster while also allowing for a smooth draw. The Cloak Mod is adjustable for cant and retention force, and is also supplied with a full parts kit to allow you to set up the holster the way you want to wear it. The warranty offers a 30-day test drive, which means you can send it back for a full refund any time in the first 30 days if you don’t like it. One of the best parts about buying an Alien Gear Holster is the customer service. Alien Gear warranty protects the holster from any kind of damage or defect for lifetime, meaning you’re covered no matter what happens to it. Even better, Alien Gear offers a shell swap program – if you buy the holster to fit a gun and change your mind, just send your holster back to Alien Gear and tell them what gun you want it to fit. They will swap out the kydex shell to fit your new pistol, for free! Of course, as an OWB holster, it will be difficult to conceal. This would not be a good choice for somebody who wants to carry concealed all the time, unless they are willing to have a dedicated outfit to cover it. It would be best used for the range or outdoors activities. The Cloak Mod is a comfortable, secure, adjustable, and worry-free purchase for somebody who wants an OWB holster. IWB and OWB holsters are great, but sometimes you won’t be dressed to wear a proper belt to support them. It’s in these times that a belly band holster comes in handy. A belly band allows you to carry a concealed handgun securely and comfortably under restrictive clothing such as gym wear. Belly bands do help with concealing a firearm, but keep in mind that they are not very secure. It is best to use them only for lightweight, small handguns and not rely on them for a primary method of carry. The Kaylle Belly Band is a well-made and comfortable piece of equipment for discrete concealed carry in any situation. The Kaylle utilizes a magnetic retention clip and micro-velcro technology that allows for a smooth and quiet one-handed draw. The neoprene construction fits all sizes, up to 45” in circumference. It is adjustable for all sizes of people and all manner of carry. Kaylle also offers a 90 day guarantee and full refund, making it a risk-free trial investment. Sometimes traditional mid-body methods of concealment just won’t do. For these times, it’s good to have an alternate method of concealment. 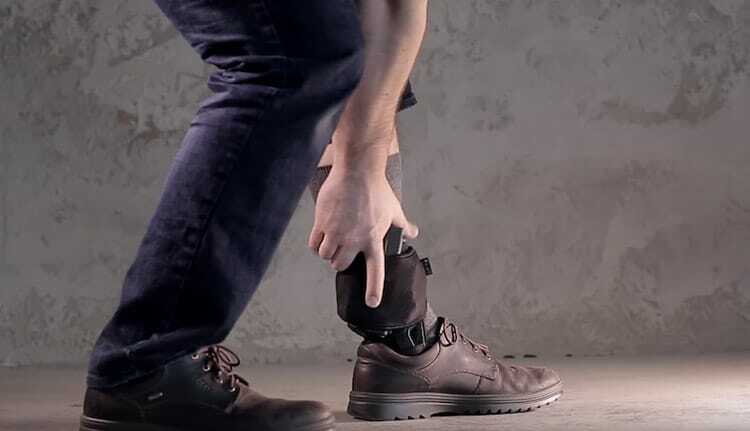 Once more popular than it currently is, ankle carry is a valid way to carry a concealed firearm when you have no other options. The ComfortTac ankle holster is designed to fit a wide range of guns that are compact or smaller. This means that you don’t have to commit to buying a holster for every carry gun that you have and you can choose which one fits the situation best. The negative side of the comfortTac is its position. Although it’s easy to conceal a firearm at the ankle, it may be uncomfortable for long lengths of carrying. It is also slow to draw from and may be difficult in some situations. The ComfortTac is available in 2 band sizes to fit all sizes of leg. It also allows you to carry the holster over a boot and under a pant leg for better comfort. The ComfortTac uses a neoprene band, like athletic clothing, to ensure comfort. In addition, a foam pad placed behind the firearm’s location keeps the firearm from digging in to your leg. Shoulder holsters are often associated with the 80’s and undercover cops, but they shouldn’t be underestimated as a method of concealment. A shoulder holster is a convenient way to conceal a medium to full-sized firearm with spare ammunition and keep the weight off of your belt line – provided you don’t mind wearing a cover garment. The Gould & Goodrich holster is made from premium vegetable-tanned leather for superior finish, comfort, and durability. A back swivel helps keep the firearm oriented correctly, aiding in proper concealment. The Gould & Goodrich is a very good quality holster, but it is an expensive option. Consider whether you want to invest in one very good holster and commit to always carrying on your shoulder, or whether you should buy several holsters that give you options. Non-glare hardware keeps the sun and other bright lights from reflecting and giving away the presence of your holster. Easy access to 2 extra magazines means that you’re always prepared and don’t have to worry about running out of ammo or encountering a magazine malfunction. 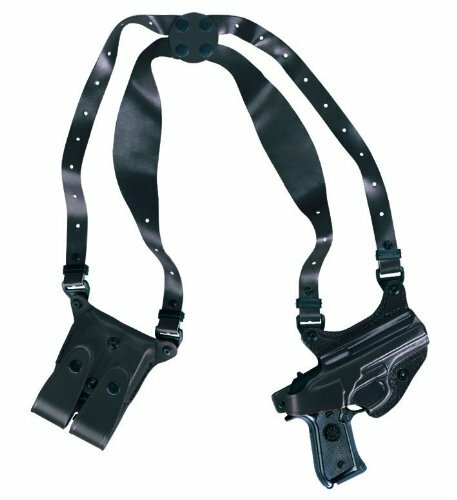 Finally, every concealed carry set up needs to include a quality gun belt. 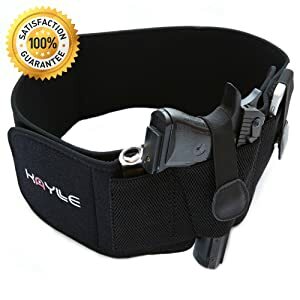 A good concealed carry belt distributes weight evenly, keeps the firearm from sagging, and generally leads to a comfortable and secure experience. The gun belt should be considered a necessary part of the concealed carry set up. The CCW Gun Belt from Relentless Tactical provides everything you need in a good quality gun belt without the high prices. Made from 1.5” leather, the belt is very sturdy to support the weight of a firearm and holster. The belt looks like any other dress belt, and is available in several different colors and stitching patterns to match a variety of everyday wear. Unlike some other gun belt, nothing about the Relentless CCW belt screams “tactical” or gives away the fact that you are carrying a gun. It is perfect for providing full support while also fitting in with the needs of everyday life. The CCW Belt is large, bulky and stiff. This makes it great for carrying a firearm but requires the right clothing with generous belt loops. No dainty shorts or pants will work with this. The Relentless Tactical CCW Gun Belt makes a perfect complement to both IWB and OWB holsters, making it compatible with several entries earlier on our list. This means one belt can cover all situations! Pay careful attention to the provided fit chart to get the right size (though Relentless Tactical will help you get the right size if you make a mistake in ordering). There are some things you need to consider when buying a holster. In addition to the different types of holster discussed above, holsters have a wide variety of features and options. You will need to understand these to buy the best holster for concealed carry. Holsters may be made of different materials. It was once common that they were all made of leather, but cheaper substitutes have come along also. Kydex is a form of vacuum-molded plastic that is very popular for gun holsters. 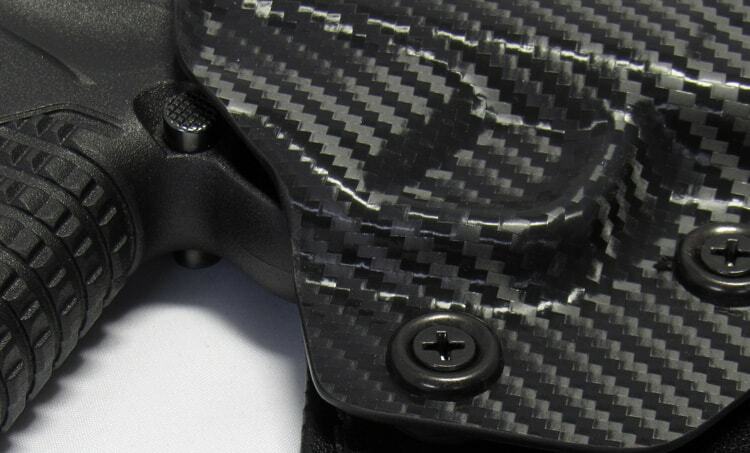 Kydex is durable, lightweight, and molds exactly to the outline of the gun. Kydex holsters are reliable for heavy-duty use and provide tight, rigid retention over long periods of use. They also are commonly adjustable with included set screws, so the user can adjust the retention to their liking and keep it tight if it starts to slip. The downside of kydex is that it is rigid and can be uncomfortable to carry concealed for long periods of time. Leather and leather substitutes are still commonly used in holsters. Good leather holsters are very stiff and hold the firearm securely, but they will wear in over time. 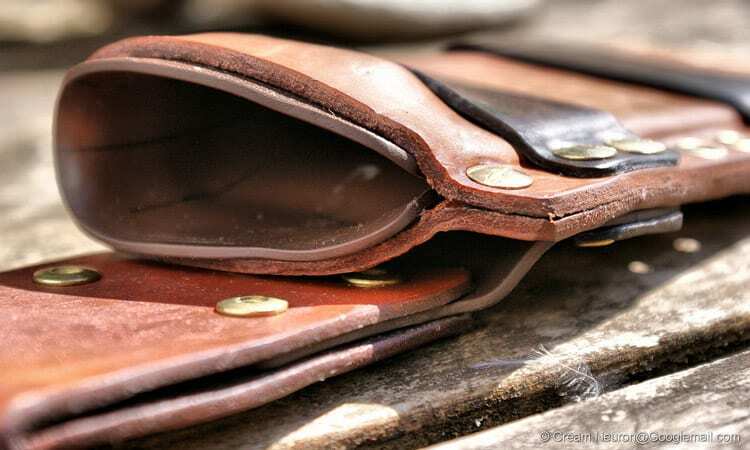 Leather holsters are soft and non-marring, so they can be used to protect the finish of finely blued or polished guns. They are also considered more comfortable for normal wear. Leather does have a couple of downsides, though. Real leather requires maintenance and cleaning. It will wear over time, and a worn leather holster can be a safety hazard as it’s possible for the holster to grab the trigger of the firearm as it’s being holstered. Leather holsters also cannot have forms of active retention that are possible with rigid kydex holsters. The other commonly used material is nylon or plastic mesh. There are some companies making great mesh holsters, but some cheap nylon holsters are cheap because the quality is poor. You have to be careful buying low-cost nylon holsters, because sometimes you get what you pay for. A nylon or fabric holster that won’t hold its shape is very dangerous, because it can fold into the trigger guard or allow the trigger to be pressed by outside pressure. Retention simply means how the holster holds on to the firearm and prevents it from coming free. Retention can be passive (held in place only by the pressure of the holster) or active (actively kept in place by a thumb strap or release button). One simple test of retention is to place the firearm (unloaded) in the holster and turn it upside down. If the gun falls out freely, it lacks adequate retention and can easily come out of place during normal activities. Many modern holsters allow for adjustment. The user can adjust the retention of the holster, how high or low it sits on your belt, and the cant (the angle at which the gun is held). Adjustment is not necessary for a good holster – if it is secure and comfortable, it will work for you. However, adjustment features are nice because they allow the user to tweak the method of carry to exactly the way they want it. To carry a concealed firearm is an awesome right to protect yourself and other innocents from danger. To exercise this right, it’s important that we take the necessary steps to do so safely and responsibly. 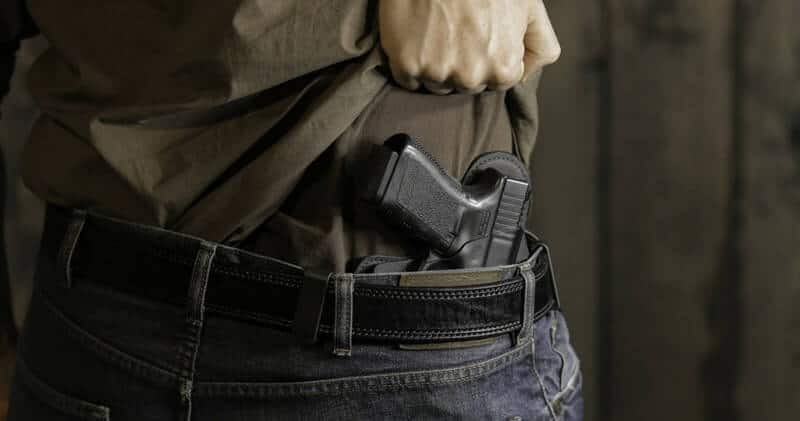 Choosing the best concealed carry holster and set up for your situation will help you have great success in carrying with discretion, comfort and safety. After reading this buying guide, you should have a pretty good idea of what to look for and of our top recommended products. I hope this has been helpful to you. Stay safe and carry on!